Two Villanova greats were among the four iconic milers honored at last weekend's Millrose Games at Madison Square Garden. 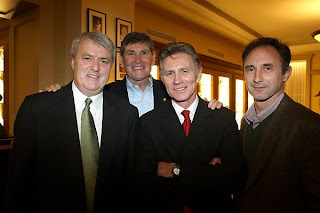 Pictured above are Raymond Flynn, Jim Ryun, Eamonn Coghlan, and Marcus O'Sullivan. Flynn, Coghlan, and O'Sullivan constitute three-quarters of the (still reigning) world record-holding 4 x mile Irish relay team that went 15:49.08 back in 1985. Below is the press release by Victah Sailer for the IAAF. New York, USA - Four of the greatest ever indoor milers gathered on the eve on the 2010 Millrose Games at the world famous NYAC on Thursday 28 January. Ray Flynn, the Irish outdoor record holder and current athlete manager; Eamonn Coghlan, the Irish Indoor record holder, the only human to run under 4 minutes after turning 40 years of age and called the "Chairman of Boards" for his 7 Wanamaker Mile victories in New York; Ireland’s three-time World Indoor 1500m champion Marcus O’Sullivan, the current coach of the Villanova Wildcats; and Jim Ryun, the most famous track and field school boy in US History who has graced the covers of Sports Illustrated more times than any track and field athlete were recognized on Thursday evening.